This building was located on the west side of S. Front Street. 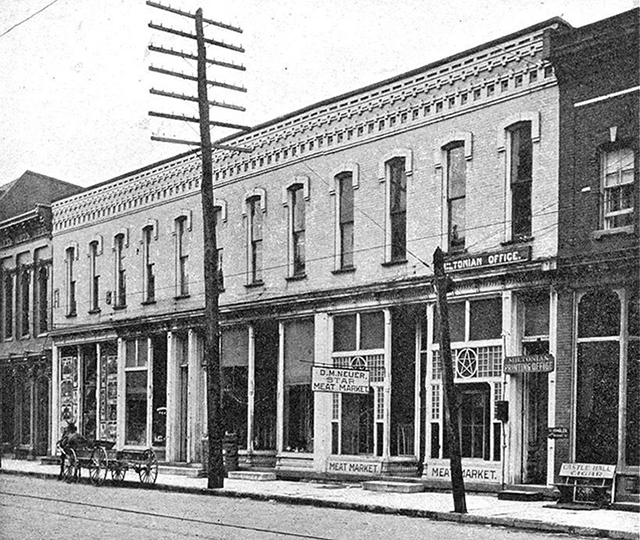 The Gauger & Sons building is to the left, and the Hackenberg building is to the right. Notice the Miltonian newspaper office on the right side. Benneville K. Haag built this building after the fire. 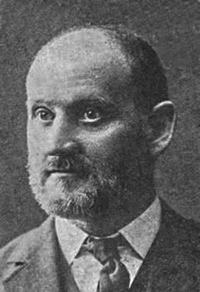 John Buoy, his son-in-law, became the owner after Haag's death in 1901. John Y. Buoy was married to Mary E. Haag, daughter of Benneville K. Haag. Mr. Buoy was in the hardware business. This picture was taken circa 1900. The meat market first appears on the map of 1901. From Bell’s History of Northumberland County 1891: John Y. Buoy, member of the firm of B. K. Haag & Company, was born in Milton, Northumberland county, Pennsylyania, March 14, 1851, son of James and Eliza (Yearick) Buoy. He was reared in Milton, and received his education at the public schools and the Williamsport Commercial College. In 1869 he went to Williamsport, entered the office of the general superintendent of the Pennsylvania railroad as train dispatcher, and held that position until 1887, when he removed to Milton and became a member of the present firm. In 1882 he married Mary, daughter of B. K. Haag, by whom he has three children: Robert, Charles, and John. 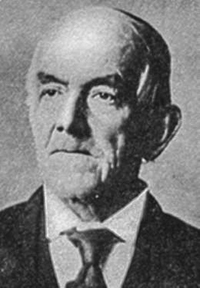 He is a member of the Williamsport Lodge, F. & A. M., and politically is a Republican with Prohibition proclivities; he is the present treasurer of the borough of Milton.